If you have been following me on twitter you know that I lost my camera. It was either lost or stolen but so far there are no suspects. I think I’m more bothered about losing the pictures I had yet to upload than losing the actual camera. I had 3 days of taco pictures on it including a taco feast from Sky’s Tacos. Once I have a new camera, which will be very soon, the taco reports will come more frequently. It had been a couple weeks since I had a taco so on the way home from work I went to El Flamin Taco at the corner of Sunset and Alvarado.El Flamin Taco is relatively new to the area and doesn’t have the local reputation yet that taco trucks like Taco Ariza’s and Taco Zone have. There’s two flat screen TV’s mounted on the wagon which no doubt will be flashing World Cup highlights in a weeks time and the wagon is shiny and clean. One of the cleanest taco wagons I’ve seen in. 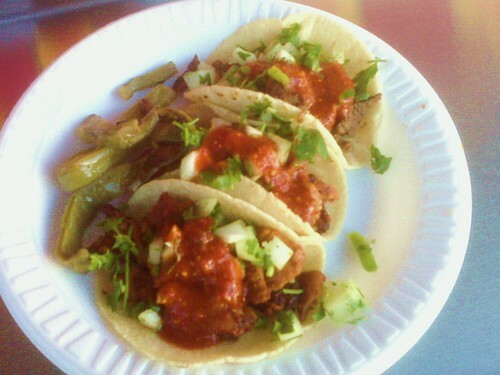 I ordered al pastor and asada and peppered them with a spicy salsa roja from the condiment tubs. The al pastor was cut from the spit and the carne asada was nicely paired with the salsa roja and strips of nopales. What really makes the tacos is the homemade tortillas. Even though the pastor was cut from the spit it didn’t have that fresh from the spit taste to it. This may have been due to the fact they had just set up and I was the first customer and the pork may have been griddled rather than spent awhile getting tender rotating in front of the heat. But when you have homemade tortillas and a great salsa even substandard meat doesn’t bring down the taco. They provide a good condiment bar that includes onions, cilantro, radishes and three salsas: roja, verde, and an avocado salsa. A nice added touch is the nopales (cactus) that go well when wrapped in the taco or eaten on their own. The roasted flavor of the cactus, the heat from the salsa and the peppery flavor of the carne asada wrapped into a fresh corn tortilla is hard to beat. It’s yet to be seen if El Flamin Taco can compete with Taco Zone and Ariza’s. Both Taco Zone and Tacos Ariza’s make a grittier taco - two or 3 biters that are little greasy bombs of flavor. The kind of taco that appeals to people who like to get their buzz on . Hey it’s Silver lake (or close enough) for god sakes, half the town is high on something. 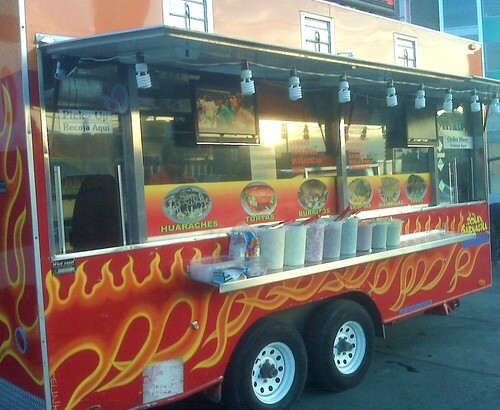 El Flamin Taco is one of the few traditional taco trucks to make use of social media. They have a twitter and a website. It’s almost World Cup time so where better to catch up on all the highlights than at the corner of Alvarado and Sunset at El Flamin Taco. OOOhhh wow!!!! I just got my life saved thanx to FLAMING TACOS after a terrible dodgers game past april 2010, I agree on your critics but in that moment couldn't get any tastier than these taquitos. you guys forgot my el pastor taco... i am devistated. 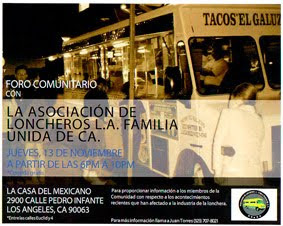 i expect a free taco and a free huarache next time. You guys need help!!! Here it is " www.stvendors.com " your well come.